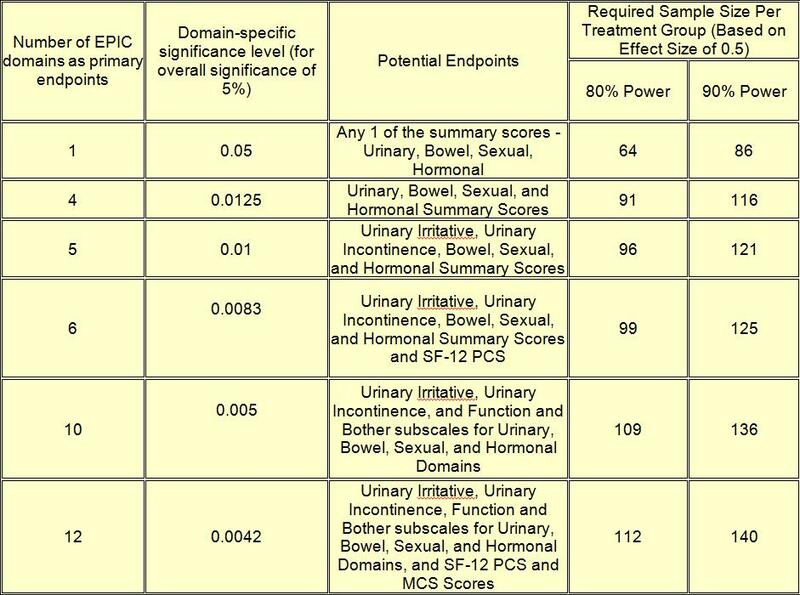 The Expanded Prostate Cancer Index Composite (EPIC) is a comprehensive instrument designed to evaluate patient function and bother after prostate cancer treatment. Content from the original UCLA-Prostate Cancer Index (PCI) was expanded with guidance from a development cohort of localized prostate cancer patients and an expert panel comprised of urological oncologists, radiation oncologists (including brachytherapy expertise), survey researchers, and prostate cancer nurses. These experts, patients, and review of the literature suggested a need to augment the UCLA-PCI with items to capture additional concerns relevant to brachytherapy, external beam radiation, radical prostatectomy, and androgen deprivation. Accordingly, the UCLA-PCI was supplemented with specific items addressing irritative and obstructive voiding symptoms (the original UCLA-PCI had queried principally incontinence only in urinary function assessment), hematuria, additional bowel symptoms (to improve the suboptimal bowel function scale from the original UCLA-PCI) and hormonal symptoms. Symptom-specific bother items corresponding to each symptom item were added to elicit multi-item bother scales for each HRQOL domain. Responses and comments from the development cohort were incorporated to derive the final instrument: the Expanded Prostate cancer Index Composite (EPIC). *This instrument can be added on to the end of any of the other EPIC instruments to collect demographic information. "Development and Validation of the Expanded Prostate Cancer Index Composite (EPIC) for Comprehensive Assessment of Health-Related Quality of Life in Men with Prostate Cancer", Urology. 56: 899-905, 2000. "Comprehensive comparison of health-related quality of life after contemporary therapies for localized prostate cancer ", Journal of Clinical Oncology. 20(2): 557-66, 2002. "Neoadjuvant hormonal therapy and older age are associated with adverse sexual health-related quality-of-life outcome after prostate brachytherapy ", Urology. 59: 480-4, 2002. "Determinants of Long-Term Sexual HRQOL After Radical Prostatectomy Measured by a Validated Instrument", Journal of Urology. 169: 1453-7, 2003. * Choose the 'Save to Disk' option after clicking on the SAS Macro name. If your browser displays the macro on the screen as a text file, choose File -> Save As, and then choose a location to save the macro. What does EPIC stand for? EPIC stands for the Expanded Prostate Cancer Index Composite. What is EPIC? EPIC is a comprehensive instrument designed to evaluate patient function and bother after prostate cancer treatment. Do I need to pay a fee to use EPIC? No, there is no fee required to use EPIC. Wei J, Dunn R, Litwin M, Sandler H, and Sanda M. "Development and Validation of the Expanded Prostate Cancer Index Composite (EPIC) for Comprehensive Assessment of Health-Related Quality of Life in Men with Prostate Cancer", Urology. 56: 899-905, 2000.